What will I learn on Chart 3? 1) READ and DRAW Phrase & Sentence Booklets, photocopy and “students assemble” Each booklet contains 10 phrases or sentence to READ and DRAW. Each master sheet is 8 1/2” x 11”. 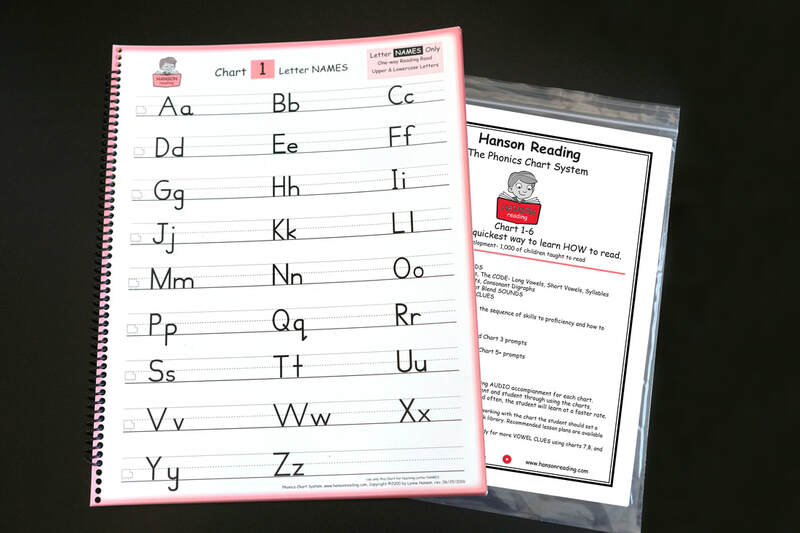 Children cut each page along “cut” lines, place the pages in numbered order, and staple the booklet together. When students are reading phrases and sentences, they must be at the second stage of decoding long-vowel words with CODE PROMPT #2 Touch the Vowels Prompt . These Phrase and Sentence Read and Draw exercises are designed to be to be another way to practice (CODE Prompt 2) and to develop fluency decoding so comprehension is not lost in the process. After each page is READ, the page is turned and the child becomes the illustrator drawing a picture of the phrase or sentence on the back of the page. Students then have a READ and DRAW booklet to read to parents; not too much to read, but an instant evaluation as each page is turned and comprehension verified by seeing the picture. The Read and Draw WORD Booklets are a great comprehension tool and springboard for vocabulary discussion. 2) GAME FLASH CARDS Phrase & Sentences, photocopy, cut flashcards apart. Each master sheet is 8 1/2 x 11 and contains 8 different words. To be a way for children to get out of their seats while practicing their new decoding skills playing the Matching Word Game. To have the opportunity for the instructor to expand comprehension as students read their phrases and sentences. To provide a way with one Matching Word Game for teachers to meet the needs of varying skill levels. Why: Students need to become fluent using CODE so they can read in books. After progressing from CODE Prompt #2, under the watchful eye of the instructor, this is the most beneficial of all the decoding exercises because it assures the correct decoding habit is being developed. This habit will be the foundation for reading all CODE words, long and short-vowel words. 3) COMPREHENSION-Worksheets, Phrase and Sentences, There are many pages of 8 1/2 x 11 Matching Word worksheets. The worksheets vary in comprehension exercises from Yes and No answers to finding the best word. Designed to provide practice decoding while strengthening comprehension as students are developing speed decoding. 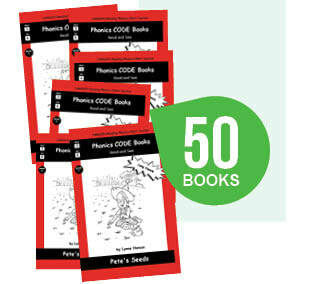 4) Phonics CODE Books, Read and See), Ready-Made (not to write in) The first storybooks designed to be the practice readers for Hanson Reading. 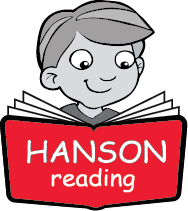 Hanson Reading has designed these books to have NO picture on the 1st page, the “READ” page. After children READ the sentence/s on the READ page, they need to “make a picture” in their mind of the word. AFTER the children read the sentence/s, they turn the page and “SEE” if their “imagined movie picture” is similar to the illustrator’s. Their picture may be different and still be correct since sentences can be interpreted more than one way. The instructor needs to discuss word meanings as the book is read.